On the 17th anniversary of the terror attack on 9/11, Mahmoud Abbas' Fatah Movement posted the above cartoon, mocking the horrific attack in which nearly 3,000 Americans were murdered. 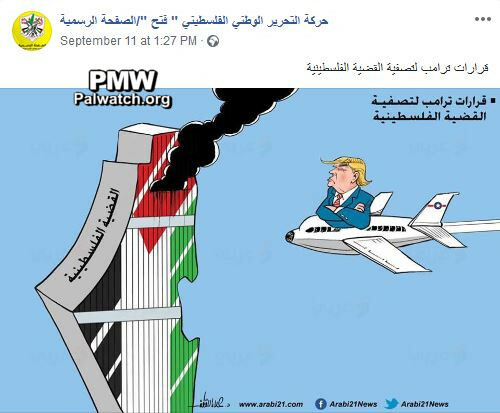 The cartoon shows US President Donald Trump about to fly a plane into a building shaped like the PA map of "Palestine" that presents all of Israel as "Palestine" together with the PA areas. The building is painted in the colors of the Palestinian flag and smoke is already rising from it. Text on building: "The Palestinian cause"
Text on cartoon and in Facebook post: "[US President Donald] Trump's decision to eliminate the Palestinian cause"
The cartoon follows the US Administration's recent decision to cut all US funding to UNRWA (UN Relief and Works Agency for Palestine Refugees in the Near East). The US sees UNRWA as an organization that perpetuates the human tragedy for millions of refugee camp residents, by imposing on them the status of "refugees" and preventing them from moving on to a productive life. The PA and Fatah prefer to impose the status of refugees on millions of people so they will see themselves as victims of Israel, demanding to "return" to "Palestine." Palestinian Media Watch has documented other Palestinian cartoons commenting on the terror attack on 9/11. US President Donald Trump's administration announced on Aug. 31, 2018 that it was immediately cutting all $360 million of annual American funding to UNRWA. Explaining the decision, the US State Department said, "The fundamental business model and fiscal practices that have marked UNRWA for years - tied to UNRWA's endlessly and exponentially expanding community of entitled beneficiaries - is simply unsustainable and has been in crisis mode for many years. The United States will no longer commit further funding to this irredeemably flawed operation." The move came after the US froze two planned payments to UNRWA in early January 2018 for more than $100 million, and the US administration spoke about the need to reexamine and conduct a reform of the UN body. This occurred after the PA refused to negotiate with Israel and cut diplomatic ties with America following US recognition of Jerusalem as Israel's capital on Dec. 6, 2017. Headline: "Hamdallah: We refuse to surrender to the American extortion, the Trump administration is a partner of the occupation"
"[PA] Prime Minister Rami Hamdallah emphasized the refusal of the leadership - and primarily [PA] President Mahmoud Abbas and the [PA] government - to surrender to the American extortion and to the decisions that [US President Donald] Trump's administration has made and will make. He emphasized that it will not replace the firm national rights for political money. Hamdallah... again emphasized that the American administration is no longer a partner in establishing peace, and that at the moment it is a partner to the occupation and to undermining the stability - not only in Palestine, but in the entire region." Headline: "Palestinian condemnation of the American 'extortion' after the cutting of financial aid"
"The Palestinian National Council (i.e., the legislative body of the PLO) viewed the American administration's decision to cancel $200 million in financial aid (s ee note below -Ed.) 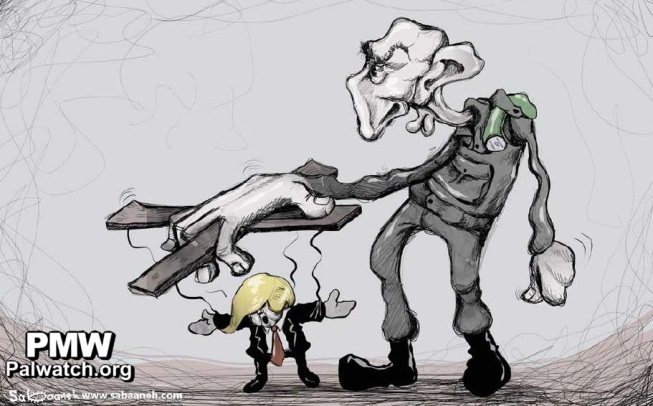 as a continuation of 'the financial sanctions war' that [US] President [Donald] Trump's administration is waging against our people and its leadership, so that they will agree to accept what is called 'the deal of the century' (refers to Trump's as yet unpublished Middle East peace plan -Ed.). The council emphasized our people's right to continue its legitimate struggle until it achieves all of its legitimate rights. PLO Executive Committee Secretary, [Fatah Central Committee member, and PLO Chief Negotiator] Saeb Erekat said yesterday that 'The aid is not a favor to our people, but rather an obligation of the international community, which bears responsibility for the continuation of the Israeli occupation that constitutes a fortified wall before the possibility of developing the Palestinian economy and society.' He said that Washington is evading this international commitment by having stopped this aid." The US State Department announced on Aug. 24, 2018, that $200 million in aid to the Palestinians will be redirected to "high-priority projects elsewhere."